PM&L Theatre will be holding two free auditioning workshops on April 20th and April 27th from 11:00 am - 1:00 pm in PM&L's Tribute Hall. April 20th will cover auditioning for non-musical productions, and April 27th will be about auditioning for musicals. Chris Riter and Rebecca Zellar will lead the April 20th Auditioning Workshop. This workshop will cover tips on how to prepare for auditions, and make a memorable impact during cold readings and monologues, which will help set participants up for being called back and cast in a production. Participants should be prepared to cold read materials provided. Rebecca Zellar, Nicole Heyl, and Paul Bleadow will be leading the Auditioning for a Musical workshop. Participants will be lead through a typical audition process covering song selection, cold reading, and dance/movement auditions. Participants are encouraged to bring a 16-32 bar music selection and be dressed to move. Chris Riter graduated with a BA in Theatre from West Virginia University, and was a part of the school's acting studio. He was a co-founder and co-artistic director of The GreyZelda Theatre Group, a Jeff-nominated storefront theatre company which ran for eight years in Chicago. He directed The Insanity of Mary Girard by Lanie Robertson, Desire Under the Elms by Eugene O'Neill, and A View from the Bridge by Arthur Miller for GreyZelda. He has acted in PM&L's All My Sons (won Best Actor in a Supporting Role for his portrayal of Chris Geller), A Christmas Carol (played Bob Cratchitt in 2014, and won Best Actor in a Minor Role as Jacob Marley in 2016), and played Bob Ewell in To Kill a Mockingbird. Rebecca Zellar graduated with a BA in Theatre from Michigan State University. She was a co-founder and co-artistic director of The GreyZelda Theatre Group, a Jeff-nominated storefront theatre company which ran for eight years in Chicago. With GreyZelda, she directed and adapted Franz Kafka's Metamorphosis and Hawthorne's The Scarlet Letter. She cowrote with Chris Riter and directed The Thimbleberry Gallows, and directed The Skriker by Caryl Churchill. She has acted in several productions at PM&L Theatre including Sondheim's Sunday in the Park with George (won Best Actress in a Lead Role for her portrayal of Dot/Marie), Marta in Sondheim's Company, and Rosalind in Shakespeare's As You Like It. She has adapted and directed A Christmas Carol (2015 and 2016) and recently directed The Secret Garden and Songs for a New World. She will be directing Angels in America: Millennium Approaches in May 2020. Paul Bleadow holds undergraduate and graduate degrees in music education and performance from West Chester University of PA, and has completed additional coursework in Music Education at Northwestern University in Evanston, IL. He has nearly 20 years experience in education, and has taught vocal music at every level from preschool through university. He is also an active performer, director, and accompanist with various community theatres and choruses in NE Illinois and SE Wisconsin. Paul’s most recent music directing credits include: The Secret Garden, Songs for A New World, and Young Frankenstein. Nicole Heyl holds an undergraduate degree in education from Purdue University. She has over fifteen years of experience in education and has held positions as a music and movement educator, vocal coach, choreographer, director, and vocal director in NW Indiana, NE Illinois, and SE Wisconsin. She currently is the Choir Directress for the United Methodist Church of Antioch and Choreographer for the Riverport Chorus of Sweet Adelines International in Bristol, WI. She also is an active performer and vocal director with various community theatres. Nicole’s most recent vocal directing credits include: The Secret Garden, Songs for A New World, and Man of La Mancha. PM&L is a non-profit, community-based volunteer organization located in historical downtown Antioch, IL. 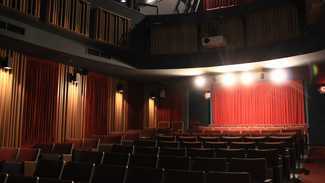 Visit www.pmltheatre.com for ticket purchasing, show announcements, news, and more about our season. We are also on facebook and twitter.